A postcard addressed to Miss Carrie E. Rand, So. Lagrange, Maine, Aug 24, 1905. 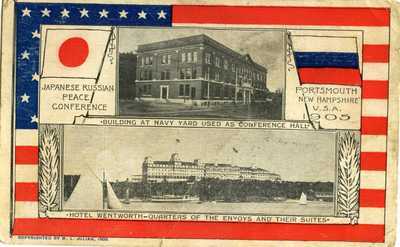 Text on the front reads "Japanese Russian Peace Conference, Portsmouth, New Hampshire U.S.A. 1905, Building at Navy Yard Used as Conference Hall, Hotel Wentworth, Quarters of the Envoys and Their Suites." From the papers of Carrie R. Dolloff, a teacher from Maine, born in 1881, who lived in several Maine communities throughout her life including Old Town, Castine, and Biddeford.